A full day trip to the backcountry of world famous Charlotte Harbor is like stepping back in time. It’s miles of mangrove shorelines, shallow grass flats, sand and oyster bars are home to snook, trout, redfish, tarpon and more. You will also marvel in the wildlife that is abundant there- white pelicans, herons, egrets, ospreys, dolphins and manatees call the area home. Since the area is mostly very shallow, it is accessible only by shallow draft flats boats and wading the flats.There are good opportunites for sight fishing here. 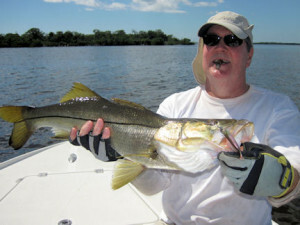 Gasparilla Sound is about 40 miles from Sarasota, so we trailer there and launch close to the area that we will fish. Due to the distance, thisis a 6-hr trip. Jack McCulloch, from Lakewood Ranch, FL, caught and released this snook on a CAL jig with a shad tail while fishing the backcountry of Charlotte Harbor with Capt. Rick Grassett. and draft on the boat. Includes lunch on an 8-hr trip.